Earring Swap & Blog Hop! Who doesn't love earrings? Well, maybe people who hate fun, but for the rest of us, earrings are both fun to make and fun to wear! Jessica Murray, of Whimsical Monkey, organized a wonderful artisan earring swap and corresponding blog hop. We were paired up, received a list of "likes" from our partner and were charged with creating a pair of earrings for that person. I was paired up with Shellie Grady of Creative Ecletica, who was faced with a move during all of this, so she has been one busy woman! In the pic above, you get both the front and side view of how they look. The pic is a smidge blurred, because they wouldn't stop swinging! Here they are, nice and still. Sadly, I haven't yet received my earrings from Shellie...fingers crossed they are in today's mail and I can update the blog pronto! I have been unbelievably busy at work. So what do I do? I develop a myriad of interests in new techniques I want to try. Call it creative ADD, call it passion, call it crazy--I has it. So over the past month or so, I haven't really made much to sell. 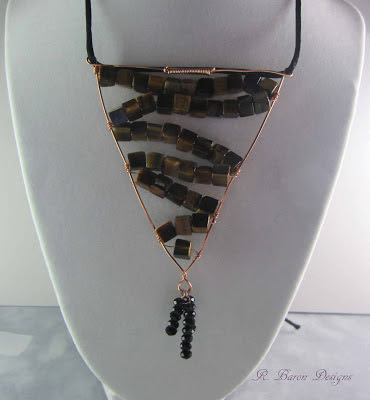 I've made some pieces for Znet Shows, but that's about it for jewelry. 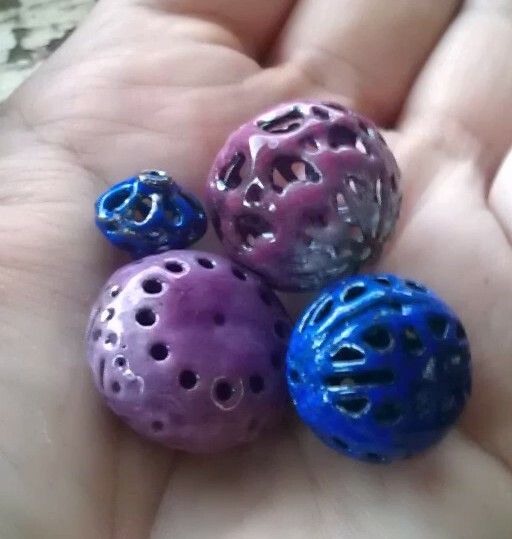 I've made a few lampwork beads, but haven't managed to even eke out a full set! And, a bunch of enamel flaked off...that wasn't supposed to happen! 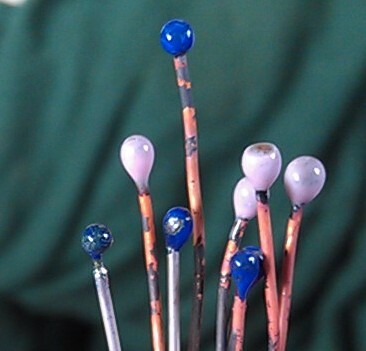 Then I find out that headpins are a pain to enamel, because they tend to flake. So I feel better, and have done my research to fix that problem. Next, a wonderful friend of mine took time out of his busy schedule to teach me how to use a jewelry saw. I had already heard from others that I could expect to break blades, curse a lot, and basically, swear off cutting my own metal forever. Well, he is a great teacher, because he was able to advise me of the pitfalls and correct my technique so that I was able to practice without breaking my blade once. Yes, I am impressed with myself. I still need to practice my straight lines, because I want them perfect, but I think I've got the curves down nicely. Finally, I have been itching to do more bead enameling ever since I took my class last August at Bead Fest. I am finding that a lot of the raw copper beads out there really aren't pure copper, because I have had a lot of issues. 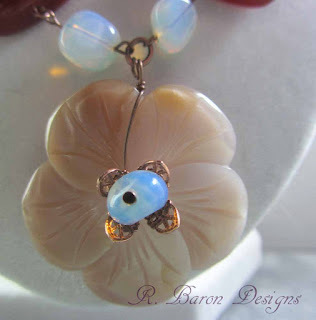 But I finally ordered some iron beads from Barbara Lewis, and had some great results. You can see that the small blue one has some parts around the hole where the enamel didn't adhere. There must be some zinc in that part of the bead, because this has been a consistent issue with that style. 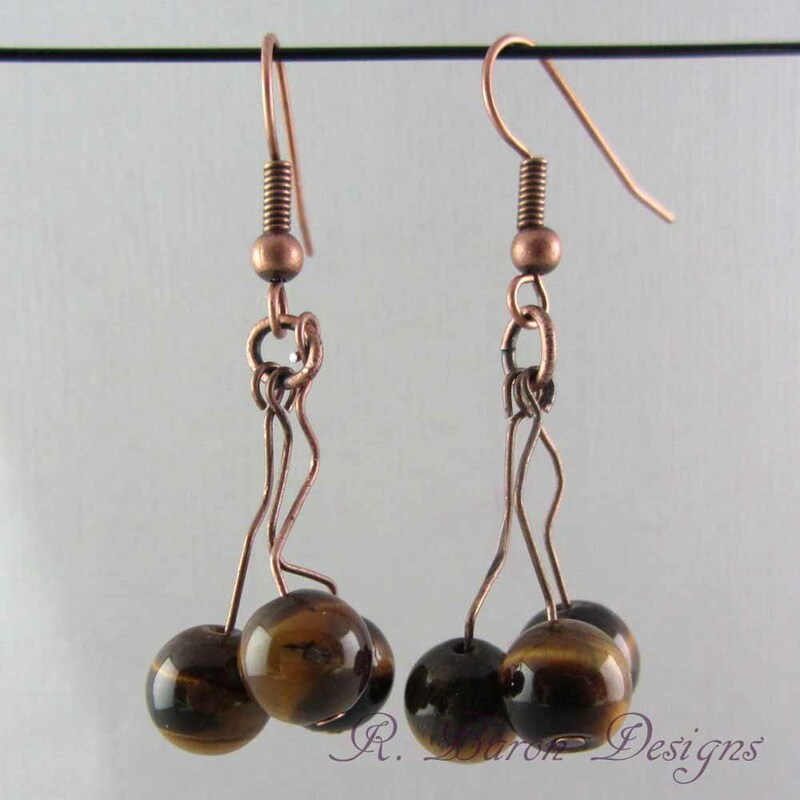 Thankfully, I bought the small copper beads at a bead store and only bought a few, so I'm going to just use them as regular copper beads in my jewelry instead. Next on the agenda? Etching! 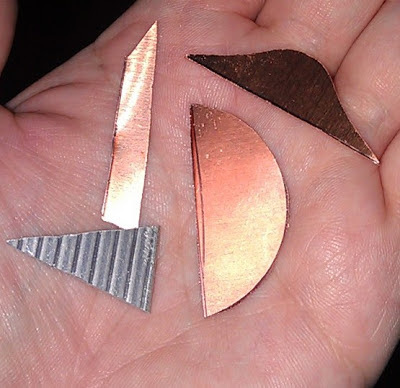 My plan is to etch some copper, and then use my new sawing skills to make some funky earrings. Someday, maybe I'll settle on one thing...but not today! ZNet Shows Diamonds in the Rough Reveal! 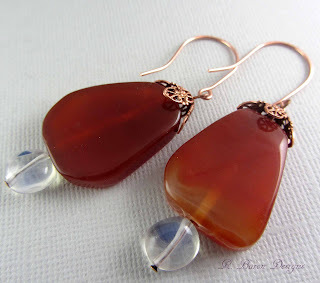 If you follow this little blog o' mine, you may remember that I was part of the design team that was selected to play with the new sea glass components from Znet Shows. Well, they are an extremely generous group of people, because I was also allowed to partake in their newest design endeavor; taking some overlooked wholesale beads, and giving them some fresh life. I was allowed to chose from a long list of beads that were being passed over, and Znet sent me a huge collection of beads to play with for free! Every beader's dream, right? 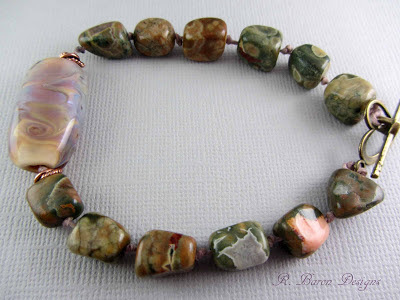 You can also enter to win a gift certificate from Znet Shows, so you can play with some of their cool beads--check out the end of this post for how! 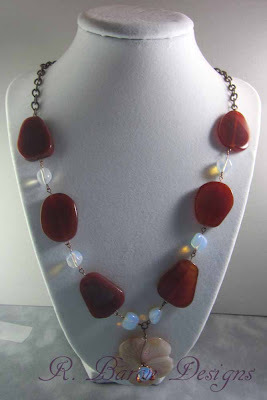 One of the first stones I wanted were the carnelian flats. They were perfectly organic in their irregular shapes and the color was beautiful and deep. The warmth of the stones begged to be coupled with some lighter, more feminine components, including a lovely mauve shell pendant. Here is a close-up of the pendant. I added an opalescent quartz nugget to make it more 3-dimensional. 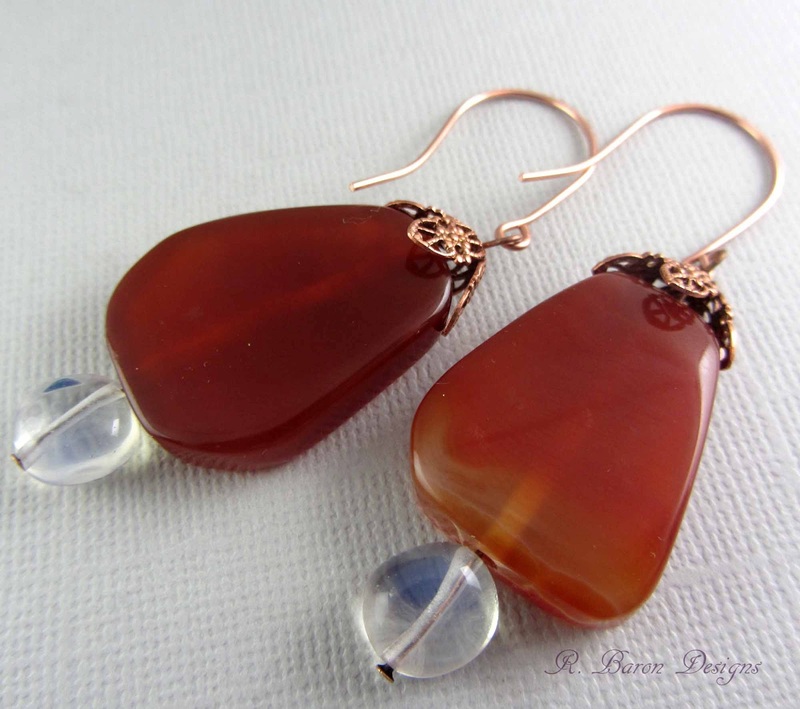 Below are a pair of matching earrings, which are surprisingly light, for having the big chunky carnelian beads. I made some copper ear wires to finish them off. For the next piece, I knotted the rhyolite nuggets on some irish waxed linen, and used one of my own lampwork beads as a focal. Next I grabbed some of the round tiger's eye beads, and made some funky, freeform earrings. A photo can't quite catch how fun these are, since they have a ton of movement to them! Finally, I was able to craft one more necklace. I wanted to use another of the gorgeous shell flower pendants that I was sent. What came to mind was a perfect necklace for summer. 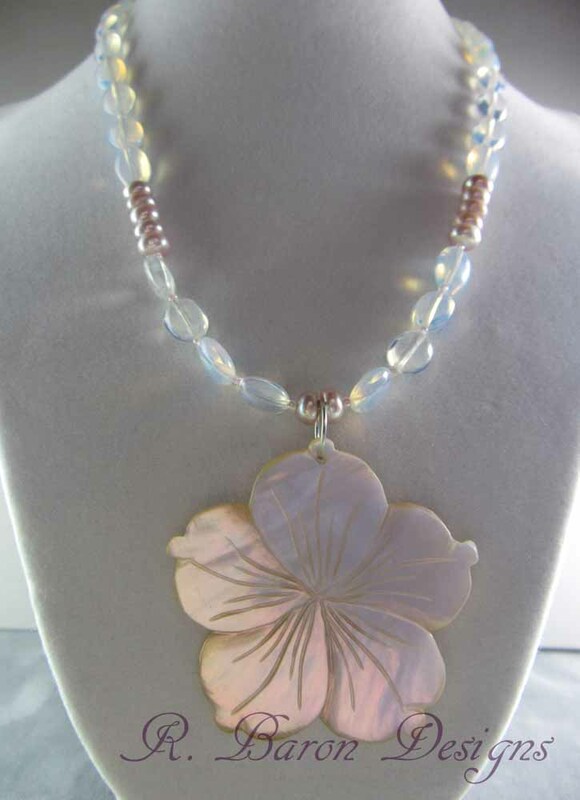 Shimmering whites, with a hint of mauve from the pearls, perfect to with that little sundress you've been waiting to wear! I did not get to all of the beautiful beads that were sent my way--there were so many of them! I also received some tiny bamboo coral rounds, some poppy jasper rounds, cool grey fire agate beads, and a pair of smaller flower pendants. If you want to see the actual beads, click on the links above...and if you fall in love and buy some pretties, tell them Rachel sent you! Now, if you would like to get some chances to win a $20 gift certificate from Znet Shows, check out the Diamonds in the Rough Top 20 vote on Facebook! Click on an individual picture, then click "like" to vote for it--and you can vote for more than one! Good luck!